TheRealPhoenix of AssemblerGames forums managed to get his hands on the ROM for Quik the Thunder Rabbit, an unreleased SNES remake of an Amiga title. It goes from platforming to an auto-scrolling shooter to a fighting game. It’s definitely worth preserving, both as a sequel to a previous title and a quintessential slice of video game strangeness. However, instead of merely releasing the game into the wild, TheRealPhoenix took some liberties and edited in a splash screen to the start of the game. He also made some smaller alterations to the game’s code. The version of Quik the Thunder Rabbit that he released was not the original version. Seriously, both the left and right images are part of the same game. “In the interests of preservation, would it be possible to upload the unedited ROM image?” an individual from fan site SNES Central asked on the forums. The answer was no. “It’s like a person finding a lost Picasso but adding a watermark to the image,” Matthew Callis said. Callis is a hobby preservationist who maintains a catalog of Super Nintendo games at superfamicom.org. While Quik the Thunder Rabbit might not be a Picasso, the fact remains that maintaining the original games files is important to preservationists. Those files exist but TheRealPhoenix won’t share them. He claims that the alterations to the game’s code will help protect the individual who gave it to him from being identified. He says some changes were necessary to help the game run. This start screen was not present on the original ROM. Altering the code of leaked ROMs can lead to the loss of the original versions. In one of the most extreme cases, NES title Hoppin’ Mad’s unfinished demo was released after a hacker added in additional features. The edited ROM is the only publicly accessible version of the game. Game historian Frank Cifaldi explains that there are many reasons that leaked game data might be changed. Enthusiastic hobbyists can be grabbed by the urged to “fix” things they believe are broken. In such cases, good intentions can still bring lost games to new players. Alterations can be made for less altruistic purposes. Investors or collectors might want to keep a very rare commodity to themselves. Cifaldi even claims that groups of ROM enthusiasts in Japan will watermark games and alter code so they can determine who leaks a file if a game previously kept within their small circles somehow makes it to the wider public. 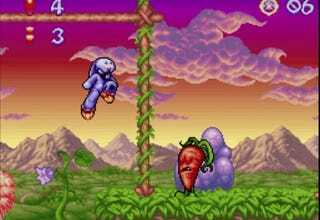 The public ROM for Quik the Thunder Rabbit is playable and should satisfy the curiosity of amateur historians and Super Nintendo fans. The genuine article remains locked away. Perhaps TheRealPhoenix will release the original version. For now, preservationists must struggle with the fact that another piece of gaming history seems just outside their reach even as players get to enjoy a new, slightly altered game.